Three years, three schools. During the next three years I went to three different schools, as my father went from one army posting to another. Richmond High School was unusual. It had been built just before the war started, and was a no- expense-spared, state of the art modern building with even the chairs and tables designed ergonomically and in harmony with each-other and the architecture. Unlike the historic boy’s grammar school nestled down in the town opposite the medieval parish church, the girls’ school was built high above the River Swale on the edge of the town looking across rolling farmland. Designed by Denis Clarke Hall, a modernist architect, whose father was one of the founders of the National Society for the Prevention of Cruelty to Children – NCPCC – it broke new ground for school design. Building was completed in 1940, the windows arriving miraculously from Switzerland, and the school furniture was designed by the great Finnish designer Alvar Aalto. From the entrance hall the staff rooms, and library led off to the right, the assembly hall to the left, and straight ahead stretched a long, blue- tiled light-filled corridor for about a hundred yards. On the right, three short blue-tiled corridors or stalks as they were known, branched off from the main corridor at intervals, and at the end, divided into two classrooms. The classrooms were large, high-ceilinged airy rooms with windows stretching along two sides, from desk height to ceiling, and equipped with full- length Venetian blinds – very modern in 1950. In the cloakroom, we each had our own hooks for hats and coats, and beneath them fitted benches equipped with shoe boxes for our indoor shoes. Similarly, in the gym cloakroom and showers, we had our own hooks for shorts and gym vest, towel and shoe racks. It was a perfect example of architecture actually working for the purpose it was designed, with no fish-hooks in it. It also educated my eye, so I was already in tune with the lines of Scandinavian architecture and furniture design which became the rage during the fifties and sixties. From here I went to Aldershot Grammar, an old fashioned red brick building, over-used and over-crowded, and I missed the beauty of Yorkshire, the charm of old Richmond, the great achingly-empty spaces of the moors, the thick leafy trees in the dale, and rushing water of the River Swale, ruined abbeys, medieval churches and the Norman castle. Then, moving from the built-up Aldershot garrison town and rather grim grammar school, I started yet again at Swanage Grammar, another red brick building, this time on the edge of a sea-side town. The festival was so devised that everyone could find some talents to develop and was required to enter four events… I won the short story competition, and the declamation prize, making my mark with Shakespeare’s ‘This royal throne of kings’. Today, these three schools no longer exist. The first was merged with the medieval boy’s grammar school and local secondary modern schools, the second seems to have disappeared so thoroughly it’s not even in records, and the third stands empty, merged with other area schools. I find it sad. Each school I went to belonged to a different examining board, the Oxford, Cambridge and London, so I had to start afresh with a different syllabus at each one, and this was where my reading stood me in good stead, though it didn’t help with my disjointed maths career. My navy school uniform which had lasted me since the first school, just made it to the day I left to go to Malaya, darned and skimpy and about to collapse! In the two schools with brown uniform I had stood out like a sore thumb. After my London holiday, my next was in France, an adventure I wrote about in my blog called My Tour de France. 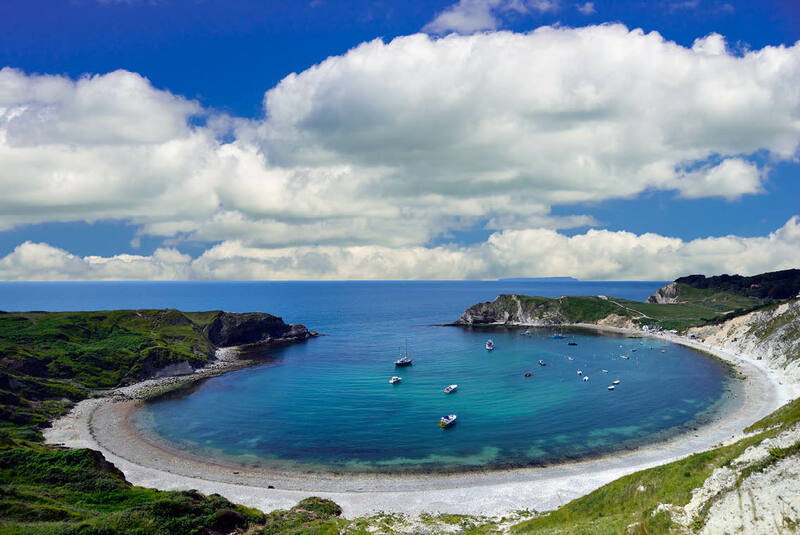 The last summer holiday before leaving England was at Lulworth Cove. We lived there for a year, and to get to school at Swanage I had to catch a bus at 7am, change to catch a train at Wareham, arriving in Swanage to catch another bus up to school. The return journey saw me wearily arrive home at six o’ clock. It was a hard year. I cooked my own breakfast- one egg, one rasher of bacon and a piece of bread- at six thirty, fed and let out the twelve chickens and two geese we had invested in to feed the whole family at Christmas, and left the sleeping household undisturbed as I went to catch the bus. A finicky eater, I couldn’t stomach the dreadful school lunches, but since my stepmother was sure that I had had a good midday meal, and was also sure that I had eaten it, tea back home was just some toast, followed by cornflakes before I went to bed after finishing my homework. I was always hungry. I used my penny for the bus up to school and back to the train, to buy a dough-nut for the return train journey like every- one else, until my step-mother discovered this. Always hard-up, she decided that if I could walk and run the last mile to school and back, I didn’t need the penny each way, so I sat in the train and watched everyone else eat their snack, pretending my stomach was not rumbling with hunger. As soon as I got home, there were the chickens and the geese to round up and feed, and shut up for the night in their respective huts. Homework and then bed at eight completed the day. But a bookworm can’t stop reading so I would read whatever book was obsessing me, kneeling by the bedroom door to use the crack of light from the hall, until my parents went to bed. This was the year I discovered Thomas Hardy, beginning with Tess of the D’Urbervilles. This was Hardy country, we all read him, and talked about him, and echoes of his words haunted every corner of this beautiful place once known as Summerlands. The Dorset country-side was enchanting, old grey stone cottages, and historic unchanging villages, nestled in the folds of the valleys on the Isle of Purbeck, where hedges were bent against the prevailing wind from the Channel, fat lowland sheep grazed, and ancient churches dreamed through all the days. History and folk lore and old memories brought each place alive for me. Every morning on the bus, we drove past the grey stone Elizabethan manor house where Tess spent the first night of her honeymoon with Angel Clare… round the corner in Wool was the ruined abbey where Angel carried her when he was sleep walking… While Norman Corfe Castle, where the Roundheads in 1645 had twice besieged and finally overcome Lady Mary Bankes and her Royalist garrison by a betrayal from inside – and which was then ruined on Cromwell’s orders – was a historical landmark on our journey. Perhaps the most poignant moment of history was a moment in our present. At eight o clock on the 28th January 1953, just as the train pulled out of Wareham Station, we looked at the time, and silence fell on the carriage of eight girls of different ages. We sat there in a long tense vigil, and it was a long time before anyone broke the silence, as we all lived and died the last few moments of nineteen- year -old Derek Bentley’s short life as he was hanged in London. That summer of my fourteenth birthday, my stepmother’s nephew came to spend the long holidays with us. She adored him, and gave him wonderful memories of idyllic weeks with picnics and expeditions every day. This was idyllic for me too, since I was the one taking him for the picnics and long walks and jaunts to the different beaches and bays. With our satchels filled with egg sandwiches and sometimes ginger pop, we would set off, our favourite place being a remote bay down a steep cliff, called Man o’ War Bay. We walked up the hill past a fascinating Lutyens house, through fields, down crumbling steps to reach the pebbly beach and blue water, clear as crystal, and played and swam until time to come home. Back home, my stepmother who never made cakes, had a magnificent high tea waiting for us with scrambled eggs or baked beans on toast followed by warm, freshly baked, utterly delicious date cake. The whole holiday felt like something out of Enid Blyton, ‘Four Go Away on Holiday’ sort of thing, without a care in the world. Most weekends for the rest of the year, I explored remote bays and paths that few walkers could ever use, for I roamed across the shooting ranges of the Gunnery School where my father was second in command. So I was able to reach forbidden and forbidding Arish Mell Gap, and to explore the desolately lovely village of Tyneham – commandeered by the army in 1943 to practise firing on the land surrounding it. In the early fifties, the two hundred villagers had only been gone for ten years, so their homes hadn’t suffered too much damage from gunnery shells or the decay of desertion. Back then it was a particularly beautiful English village, haunted by its past and untouched by the present, where time had stood still. When it rained, I would kneel on the sheep skin rug on the floor in my bedroom and lose myself in my latest library book. Though none of my school friends lived nearby, I was never lonely, as I had a rich interior life – books, art, music, the history of ballet, ancient Egypt, history, poetry – all these interests meant I was never bored, but always dreaming, always in the midst of some absorbing passion. So I was overcome by grief at the end of The Mill on the Floss, mesmerised by autocratic Mr Rochester in Jane Eyre, irritated by Emma, loathed Becky Sharp, hated Jack London’s Sea Wolf, loved Prince Andrei and Natasha, mystified by Virginia Wolff’s allusive writing and learned by heart ‘Annabel Lee’, in her kingdom by the sea. I spent a lot of time painting. My father would bring me long strips of cardboard from the packings of the shells they fired every day on the ranges. These strips were about eighteen inches wide and three feet long, and on them I depicted in the vivid poster paints always given to me for Christmas – nursey rhyme characters like Wee Willie Winkie, Little Boy Blue, Miss Moffat and all the others. These pictures adorned not just my brother’s bedroom, but the toddler’s bedrooms of many of my stepmother’s friends. Years later one mother told me she still had these pictures. I was known as ‘good with children’, so often these same friends would borrow me to amuse their toddlers in those days before play groups and kindergartens. One mother even borrowed me for a fortnight to look after her toddler while she was recovering from the birth of her second child. While we lived here by the sea, with the help of the army padre I was confirmed in Salisbury Cathedral, and shortly after, the King suddenly died on 6th February 1952. We still, in those days, stood when he had given his speech after Christmas dinner and the National Anthem was played. The radio – no TV for us then – only played chamber music, as it was called – for a week, the newspapers were framed in black, and we all felt we were part of a huge national event. The new Queen was young and beautiful… and now after the passage of time, and the longest reign in English history, it will seem perhaps even more apocalyptic when her spoiled elderly heir inherits that ‘royal throne of kings’. The following year sweets came ‘off ration’ in the week before we sailed for Malaya. For the first time in my life sweet shops were full of sweets/candy instead of running out of stocks in the first few hours, and it was possible to buy as much chocolate we wanted, without waiting in a long queue and having to count out a measure of measly sweet coupons! I’ve always loved date cake since that year by the sea… and this recipe brings back those days. Soak 250 gms of dates in a cup and a half of boiling water and a teasp of bicarbonate of soda for about 30 minutes until the dates are soft. Beat 125 gms of softened butter, three quarters or more of a cup of brown sugar, and a teasp of vanilla. When pale and creamy add two eggs one at a time, and then stir in the date mixture and two cups of SR flour. Pour into a greased tin, the bottom lined with greaseproof paper (I use a loaf tin) and a bake in an oven at 180 degrees C for about forty minutes, or until a blade comes out clean. I often sprinkle the top with extra white sugar, just because if I’m going to indulge in sugar, it might as well be really sweet! I am so enjoying your serialised memoirs Valerie. Your stories of Lulworth Cove and Corfe Castle remind me of a very special trip to that lovely part of Dorset many years ago now… which included visiting Thomas Hardy’s charming thatched cottage, very near where my grandfather was born. Thank you for bringing back some enchanting memories. Elly, how lovely to find your comment… so glad you enjoyed this episode of the saga of my life !!! So you and your ancestors hail from this corner of England???? Dorset is a lovely unspoiled place , isn’t it… sixty years ago and more, it was even more so… those were the days ! Valerie, I have no idea how you came across my blog. Let me just say that I am loving the wonderful world that you draw up in yours. I read Thomas Hardy many years ago as a teenager from the South of India; a land so disparate from the land he wrote about. Loved him then- don’t know about now and a bit scared to go back, re-read and find out. The Four Agreements- we have something in common there. Very simple and profound advice. Will try your Date Cake recipe- how many eggs does it use? I too have a Date Cake recipe; this one is eggless, uses milk, walnuts and refined oil. Flour : 2 cups. Sugar, Milk & Dates: 1 cup each. Walnuts & refined oil: Half Cup each. Baking Soda: Slightly less than 2 tsp. (A) Mix refined oil, dates (deseeded and chopped), sugar and milk. Heat, stirring constantly. Switch off immediately after the mixture boils. Keep aside. Cool. (B) Sieve flour and baking soda together. Combine (A) and (B). Sometimes a little more milk may be required. Thank you for your lovely blog. Thank you so much for your lovely comment … I think I found your blog after reading a comment which resonated when you wrote on someone else’s! Loved your recipe, thank you, and have amended mine to say how many eggs – two… careless of me… will be more attentive in future!!! I am enjoying this serial. Your childhood, while not overwhelming with love, sounds idyllic. You found things and activities to satisfy yourself and keep you happy. More people need to understand that. Denying you the penny for you to chose for either the bus or a donut just was wrong. Were all the children treated like this or just the step-children? Hello Kate… thank you as ever for your comment…. I’m so glad you are enjoying my serial ! No – all the children were not ‘treated like that’ ! Just me – and I was always trying to pretend to outsiders that I was loved – it seemed so shameful to be unloveable !!!! At least you had your books to get lost in. This really carried me away into your world, but being hungry is a hardship I am too soft for. I worried so much for little Valerie. You couldn’t tell your stepmother that you didn’t eat the lunches? Dear Luanne, thank you for your sweet, kind comment… no, I didn’t dare tell my stepmother that I didn’t eat the school lunches. Every time I begged to take sandwiches like some of the other girls, she refused, and told me to eat the lunches provided…que sera sera… I survived – I think the daily egg for breakfast had something to do with it !!! That makes me so angry at her. That said, I do know that our standards today for people’s treatment of children are a bit different. It’s not acceptable what she did, but she was certainly not alone in her unrealistic demands of a child, unfortunately. You were an amazing child. I did not know about Derek Bentley. You had me scurrying to look up his story. I am enjoying your series. I am amazed by your ability of recollection for detail. Truly remarkable. Always so good to hear from you…so glad you are enjoying my saga! Thank you for your comment about memory … it’s something I take for granted, and am always amazed when old friends don’t remember what I do…is all well with you??? A year jam-packed with so many events – both nationally important and the everyday stuff of life – I love the way that in a paragraph you capture the sense of a place, so that I feel I lived in each one of them with you for a time. I am so enjoying this whole story. I am so grateful for you to put into words your life…as you write I often wonder if I could fashion my life into a blog post, then I think….no….my life is mundane yours is just short of amazing. If in what would be considered very harmful living for a child now days….BUT times were different at the approaches to children and animals much, much different then. Such a huge truth and sometimes one hard to remember when our ego’s are hurt. BUT still the right approach.. Always. You bring things to my attention that I didn’t know before. I had to look up Derek Bentley. As always I enjoy the sites and sounds you share and for a little while I’m transported to another time and place. I, too, was a bookworm as a girl. In later years, thanks a number of issues, I drifted away from reading for pleasure. Over the past few years I’ve rediscovered the delicious endeavor of losing myself in a book. My daughter in law introduced me to Thomas Hardy when she loaned me her copy of Far From the Madding Crowd. I look forward to your next installment. My favourite Hardy one too and yes, that film is the best. Wonderful, Valerie – I’m getting a real sense of your stepmother now, very contradictory and you had to learn to be so flexible, rapidly adjusting to new environments and talk about developing a broad and observing mind, you had quite a training ground! Loved your description of swimming in the mist. I’m getting the sense of being younger than other people who are commenting. I’m engaged by your ‘characters’ and your experiences and responses to the details around you, than by the places (apart from the war stories – I watched the film Dunkirk, recently and was spellbound and left in awe) …so just letting you know that what you have to write about is appealing on so many levels! What a life, you’ve led too! Lynne, you are wonderful the way you read and interpret what I’m writing. Your comments are such a gift, which I may have said before, but that doesn’t change the joyful impact of each one which you write here. Yes, I remember you did a post on Dunkirk and there were varied opinions – I’ll look it up! Of course, Lulworth Cove jumped out at me from the top of the page. One of my favourite spots, and revisited just over a year ago. Swanage seems to have been a delight for the artistically-inclined.